ACIS and HRC PSFLIB RETIRED! For the CIAO 4.6.1 / CalDB 4.6.1 release notes see How CalDB 4.6.1 Affects Your Analysis. The periodic ACIS T_GAIN correction upgrade for November 2013 through January 2014 (Epoch 56) has been released. The corrections are at nominal/expected levels of less than 2% of the energy value. This upgrade as usual affects observation data taken over the two most recent T_GAIN Epochs (56 and 55), and so would update PHAs for OBS_IDs taken since 01 Aug 2013. Users with such datasets are encouraged to revalidate their analysis results after reprocessing their data with the upgraded CalDB files. For specific details of the new calibrations in this release, see the technical details section below. An error has been found in the headers of the ACIS BADPIX file designated for OBS_MODE=SECONDARY cases. 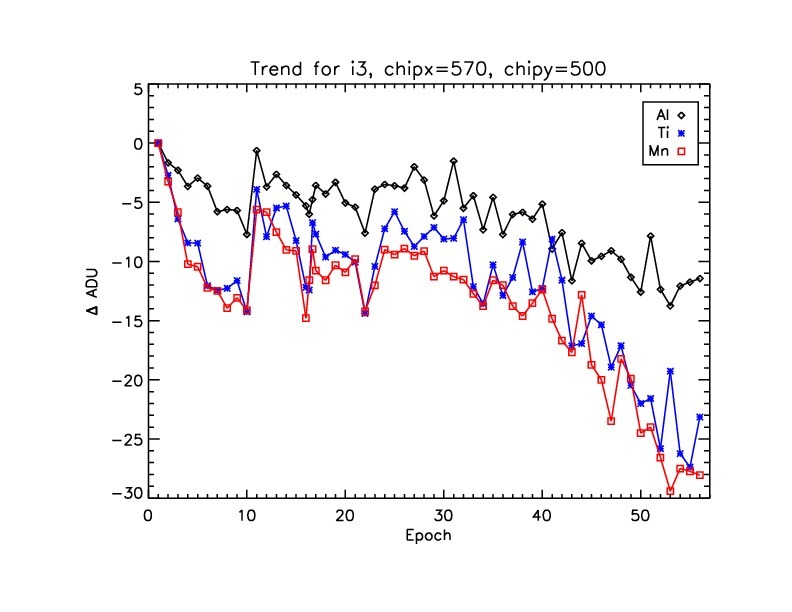 These are "engineering runs" (ERs) and not ordinary observations (ORs), primarily used to monitor the ACIS CTI effect and correct for time-dependent gain drift. The error does not affect Standard Processing at all, however it does affect manual reprocessing of archival ERs with very warm temperatures. The fix is simply to expand the boundary on the focal plane temperature (FP_TEMP), which is keyword "CBD10001" to be equal to "(148.15:188.15)K" for all headers in the above-named file. Reemphasizing, normal observations are not affected by this change in any way. None applicable to the OBS_MODE=SECONDARY case. The existing HRC-I background (BKGRND) event lists version N0001 are now being upgraded to version N0002. The newer version includes four additional files to cover the years 2010, 2011, 2012, and 2013. All of the N0002 file have been compiled using the latest level 1 calibration data, including the SAMP-based gains (GMAPs) and the latest DEGAP corrections. We also find that there is significant improvement in background estimates of more recent HRC-I observations with the newer applicable datasets. For further details, see the technical details section below. Manual procedure uses CIAO tools hrc_bkgrnd_lookup to select an HRC-I BKGRND event list and dmimgcalc to subtract the background from an image. See the second thread below. An errant keyword (TLMIN4) in the EBOUNDS extension headers of all of the HRC-I/S RMF files, which has existed since their original releases, has been found to cause difficulties when using CIAO 4.5 and later Datamodel commands such as dmcopy. The fix is simply to delete the keyword from those EBOUNDS headers. It was necessary to use the FTOOL "fv" to remove the keyword from each of the above files. Once removed, the DM problem ceases to occur. The error causes a sporadic SegV and memory dump when using dmcopy with "opt=all" on any of the above RMF files. While a fix to the software to prevent this problem has been ordered, a fix to the CalDB files is reasonable, because the TLMIN4 keyword is not needed in EBOUNDS, which is a three-column table in all cases. CIAO Datamodel tool dmcopy with "opt=all". E. ACIS and HRC PSFLIB RETIRED! The hypercube 2D PSF Library files had been used by the deprecated tool mkpsf to estimate the shape of the PSF for off-axis source positions, primarily by interpolating between the numerous stored on- and off-axis PSFs in the libraries. Mkpsf has been removed from CIAO distributions since CIAO 4.5 was released in December 2012. At that point, it was posted on the CXC CALDB main page that the files would be dropped from the CalDB after one more year of inclusion. That time has now expired. Nominally the 2d_psf files above in the directories specified above may be (carfully!) deleted from the CalDB once version 4.6.1 or later is installed on your local system. Use of the old mkpsf tool with any earlier release of CIAO or CalDB is strongly discouraged, in favor of the much more reliable and accurate online Chandra raytrace application ChaRT. In the event that the 2d_psf files are lost and simply must be made available, they may be requested from the Chandra Helpdesk. Keep in mind that they will no longer be indexed in CalDB, and can't be selected automatically by mkpsf, but must be pset manually instead. The ACIS time-dependent gain corrections (T_GAIN) have recently been updated for current changes from the previous T_GAIN epoch, specifically Epoch 56, which was November 2013 through January 2014. 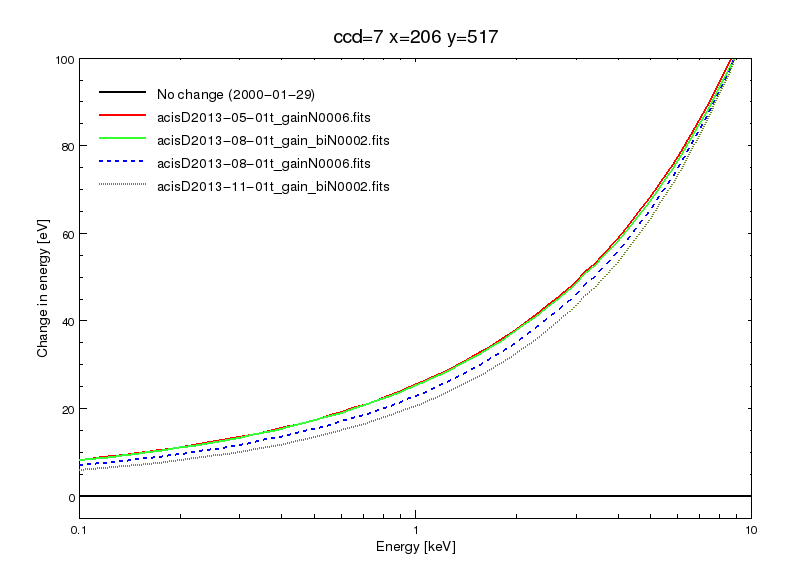 With the addition of these new corrections, derived from ACIS External Cal Source (ECS) data taken during radiation zone passes, the CalDB files extending from August-October 2013 (i.e. Epoch 55) have been finalized, and new non-interpolating T_GAIN files are now implemented for Epoch 56. 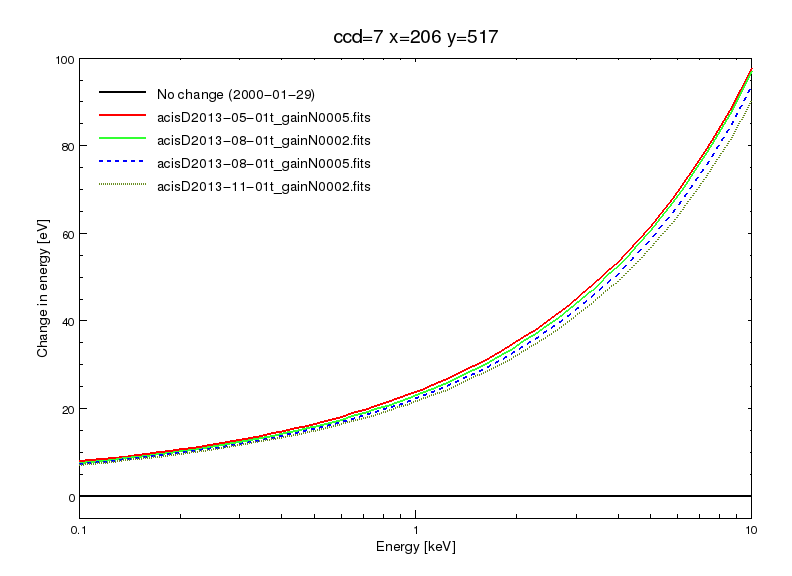 The magnitudes (in eV) of the new gain corrections, versus photon energy, are given in Figs. 1-3 below. 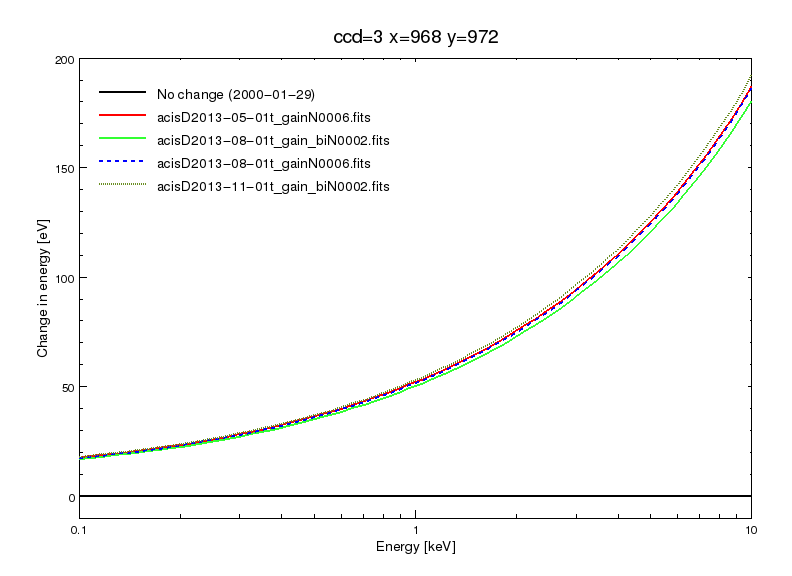 The corrections are of the usual order in magnitude, specifically less than 2.0% of the photon energy value. Fig. 1 below gives the corrections for the ACIS-I aimpoint on chip ACIS-3, for the CTI-corrected case, which is the only one applicable to FI chips. Fig. 2 gives the corrections for the ACIS-S aimpoint on ACIS-7, for the case where the BI chips are CTI-corrected. Finally Fig. 3 gives the corrections for ACIS-7 for NON-CTI-corrected BI chips. These would be relevant to GRADED DATAMODE observations with ACIS-S, for example. 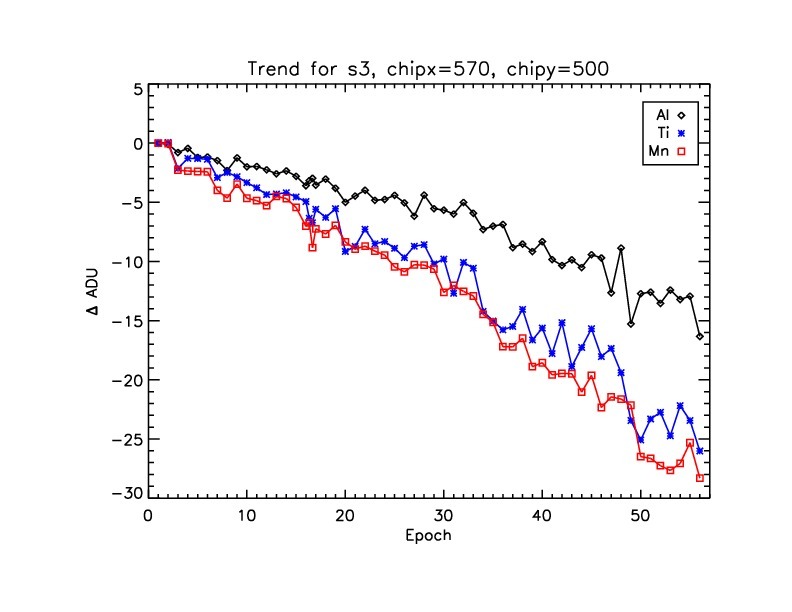 Long term trends for chips I3 and S3 are plotted below in Figure 4a and b, through Epoch 56, the latest release. The chip locations for these plots are given in the respective labels above the plots. Note that the locations are not the aimpoint positions, as with Figs. 1-3 above, but are near the centers of each chip. The change to the FP_TEMP boundary condition applied to the SECONDARY mode BADPIX file was necessary for those using CIAO to reprocess the L1 events files from the archive when the FP_TEMP of the ER exceeds 164.15K (-109C). The problem does not appear in the standard data processing of SECONDARY mode data, because the FP_TEMP is not determined in the environment at the time acis_build_badpix is run in SDP. Hence, the FP_TEMP boundary condition is ignored by the CalDB query interface in SDP. An example of such an ER is 53549, which has an ACIS focal plan temperature of 164.762K. The procedure regenerating the *bpix1.fits file in reprocessing may be seen in the thread Reprocessing Data to Create a New L2 Events File under the "Running acis_build_badpix" section. While this thread does not include the necessary information to specify the eventual output L1 and L2 event lists, the section on bpix1 regeneration is fine for this illustration. ERROR: CALDB search resulted in zero files returned. CALDB: Query resolved to "/data/CALDB/test_2/data/chandra/acis/badpix/acisD2000-11-28badpix_secN0003.fits"
The SECONDARY mode BADPIX file is selected, and the procedure may move forward. A test of several of the HRC-I BKGRND files in fluxed image background subtraction is provided in Fig. 5 below. In this test, two 2013 observations are combined, and compared with a background image generated from three different HRC-I BKGRND files. TEST 1: hrciD2013-01-01bkgrndN0002.fits, the new BKGRND file that is applicable to these data. TEST 2: hrciD2009-01-01bkgrndN0001.fits, the previously released BKGRND that would have been selected from CalDB. TEST 3: hrciD2009-01-01bkgrndN0002.fits, the new version of the 2009 BKGRND file, for comparison. 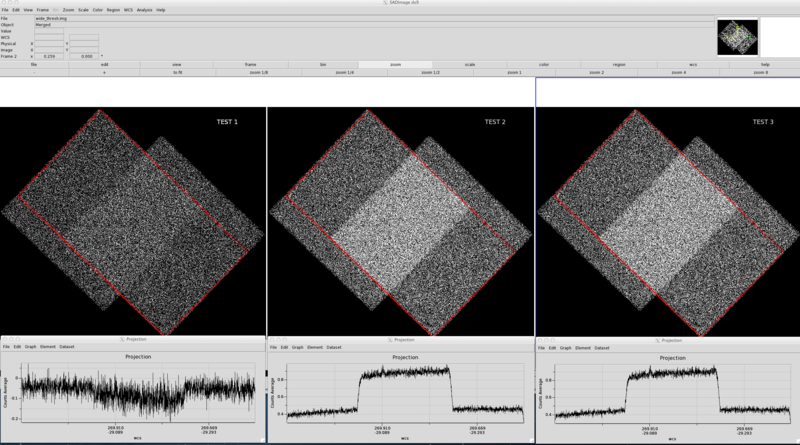 All processing parameters were the same in all tests. The background-subtracted counts images are shown in the figure, and the plots below are from the red projection regions in the corresponding frames (sum of counts along the smaller of the projection rectangle's axes plotted vs. the other rectangle axis). There is no discernible difference between the two 2009 background maps (TEST 2 and TEST 3), but they both underestimate the actual background, which is to be expected since they are from 4 years earlier and background is increasing with time. The 2013 background map (TEST 1) isn't perfect but does a much better job. file, and (TEST 3) the new 2009 N0002 BKGRND file. The error above does not always occur. A software fix will be included in CIAO in the future to eliminate this error. However, the problem with the RMFs is being fixed by removing the errant TLMIN4 keyword in the EBOUNDS header of each of the HRC RMF files.